Born at Kingston, Ontario on 4 July 1840, he worked there as a photographer from 1873 to 1878. On 29 October 1873, he married Mary Walton (1853-1897) and they subsequently had three children: Roy Walton Abbott (b 30 Sep 1878, Ontario), Maud Abbott (b 17 Jun 1882, Ontario), and Mildred Abbott (b 15 Jun 1884, Manitoba). Abbott worked at Ottawa from 1878 to 1882, when he moved with his family to Emerson, Manitoba, where his wife died in 1897. In 1902 he built a new photographic studio. In July 1906 the family moved to southern Alberta, where he and his son worked as photographers at Medicine Hat, Taber, and Raymond. In 1909 they moved to Vancouver, British Columbia. It is unknown whether Abbott continued to work as a photographer after this time. He died at New Westminster on 2 August 1914. His son worked as a photographer at Vancouver, Powell River, and Westview. His daughter Maud married Reginald Lane and moved to Powell River where she took a large collection of photographs of the area, which have been preserved and made available online by the Powell River Museum. 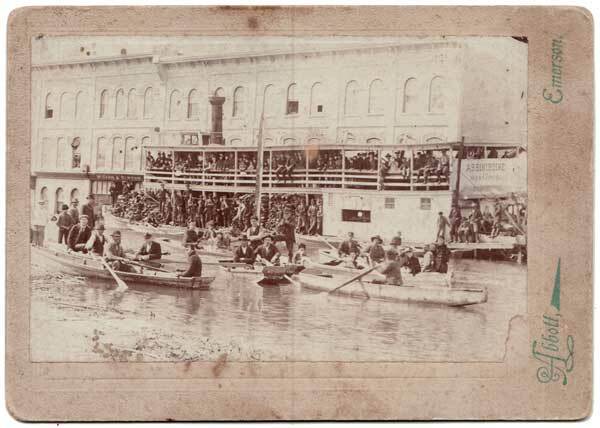 Abbott photographed the steamboat Assiniboine on the streets of Emerson during a catastrophic flood in 1897. For more information, see Steamboats to the Rescue, 1897. “Emerson,” Manitoba Free Press, 27 December 1902, page 18. “Taber,” Lethbridge Daily Herald, 5 May 1908, page 2. The Ontario Photographers List (1851-1900), Volume One by Glen C. Phillips, Global Heritage Press, Milton, Ontario, 2002. The Western Canada Photographers List (1860-1925) by Glen C. Phillips, Global Heritage Press, Milton, Ontario, 2002. We thank Teedie Kagume of the Powell River Museum for providing additional information used here.